The Security Council unanimously adopts resolution 2401 (2018) on the immediate cessation of hostilities to allow for medical evacuation and services in conflict areas, and to provide access of humanitarian aid in Syria. Prior to the meeting Security Council delegations speak with the Director of the Security Council Affairs Division (24 February 2018). 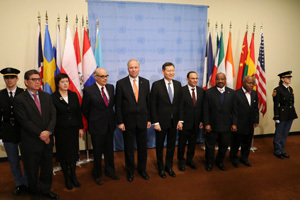 In 2018, in addition to the five permanent members: China, France, Russian Federation, the United Kingdom, and the United States, the Council was composed of the following non-permanent members: Bolivia, Côte d’Ivoire, Equatorial Guinea, Ethiopia, Kazakhstan, Kuwait, Netherlands, Peru, Poland and Sweden. In 2018, the Security Council held 288 meetings, adopted 54 resolutions and issued 21 presidential statements. It considered 48 agenda items and dispatched three missions to the field, to Afghanistan, Bangladesh and Myanmar, and the Democratic Republic of the Congo. Kazakhstan, which held the Presidency of the Council for the month of January 2018, held - for the first time in its history - a flag installation ceremony for the newly-elected members of the Council. On 30 March 2018, the United Nations Mission in Liberia (UNMIL) completed its mandate and in presidential statement S/PRST/2018/8, the Council expressed its appreciation for its important contribution throughout more than 14 years of operation in Liberia. 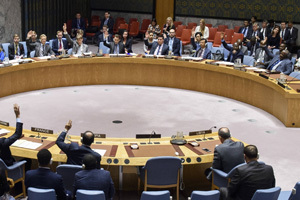 On 14 November 2018, by resolution 2444 (2018) the Council decided to lift the arms embargo, travel ban, assets freeze and other targeted sanctions imposed on Eritrea by the Security Council in its resolutions 1907 (2009), 2023 (2011), 2060 (2012) and 2111 (2013). As a result, the Council decided to terminate the mandate of the Somalia and Eritrea Monitoring Group (SEMG) while establishing a new Panel of Experts on Somalia mandated to, inter alia, monitor and investigate the implementation of the sanctions measures imposed on Somalia, namely, the arms embargo, the travel ban, the assets freeze, and the charcoal ban. 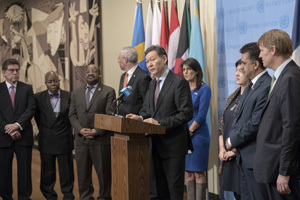 In connection with the conflict in Yemen, on 21 December, by resolution 2451 (2018), the Council authorized the Secretary-General to establish and deploy, for an initial period of 30 days, an advance team to begin monitoring and to support and facilitate the immediate implementation of the Stockholm Agreement (S/2018/1134). Newly-elected countries to the Council for the term 2018-19 hold flag installation ceremony (3 January 2018). Secretary-General António Guterres addresses the Security Council meeting in relation to the situation in the Middle East under the item entitled threats to international peace and security (13 April 2018). Meetings of the Security Council are governed by Article 28 of the Charter of the United Nations, and rules 1-5 and 48 of its Provisional Rules of Procedure. Under its current practice, the Council convenes meetings, which are classified as either public or private. Council members also frequently meet in informal consultations of the whole (also known as consultations). In 2018, the Security Council held 288 meetings: 275 public meetings and 13 private meetings. Out of the 13 private meetings, 12 were held with troop- and police-contributing countries (TCCs/PCCs) and the remaining one featured the briefing by the President of the International Court of Justice. In addition to the 120 consultations held during 2018, the Council held briefings and/or discussions under “Other matters” (also known as “Any Other Business” (AOB)), on 35 occasions. In 2018, the Council held, on average, 24 meetings and 10 consultations per month. June was the month with the most meetings held (a total of 31), while May reached the maximum number of consultations held per month (with a total of 14). 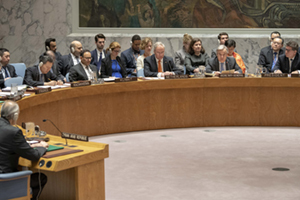 View of the Security Council chamber as a moment of silence is observed in honour of former Secretary-General Kofi Annan (23 August 2018). * “Other matters” refers to the substantive briefings and/or discussions under “Other matters” (also known as “Any Other Business” (AOB)) during consultations. Donald Trump, US President and Council President in September, chairs meeting on the maintenance of international peace and security. 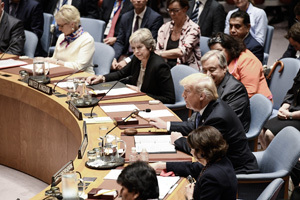 To his right, Secretary-General António Guterres, Theresa May, Prime Minister of the United Kingdom, and Margot Wallström, Minister for Foreign Affairs of Sweden. To his left, Rosemary DiCarlo, Under-Secretary-General for Political Affairs and Evo Morales Ayma, President of Bolivia (26 September 2018). In 2018, the Council held 15 high-level meetings, in which two or more Council members were represented at ministerial level or above. On 26 September 2018, the Council held a high-level meeting on the maintenance of international peace and security, which focused on non-proliferation of weapons of mass destruction, and registered the highest number of Council members represented at a high-level in 2018. Ten Council members were represented at the level of Head of State or Government, and five were represented at ministerial level. [For details see Annex, Table I]. Security Council Members brief press on mission to Afghanistan (17 January 2018). According to Article 28 of the Charter of the United Nations, each member of the Security Council shall be represented at all times at the seat of the Organization. Rule 13 of the Provisional Rules of Procedure provides further that each member of the Security Council shall be represented at the meetings of the Security Council by an accredited representative. While all Council members have one Permanent Representative (PR) for a total of 15, some Council members may appoint more than one Deputy Permanent Representative (DPR) to the Council. In 2018, the number of women Permanent and Deputy Permanent Representatives on the Council was ten, while the number of men Permanent and Deputy Permanent Representatives was 29. According to rule 39 of the Security Council Provisional Rules of Procedure, the Council may invite members of the Secretariat or other persons, whom it considers competent for the purpose, to supply it with information or to give other assistance in examining matters within its competence. In 2018, the Council invited a total of 350 speakers under rule 39, of which 246 were men and 104 were women. In addition, out of the 350 invitees, 226 were officials belonging to the UN System, 71 were officials representing regional intergovernmental organizations, 11 were invitees from international organizations other than the UN, while 42 invitees were representatives of other entities such as non-governmental organizations. 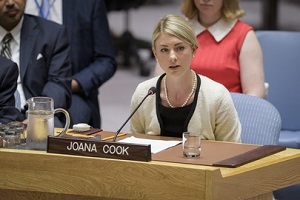 Joana Cook, Senior Research Fellow at the International Centre for the Study of Radicalisation, briefs the Security Council on threats to international peace and security caused by terrorist acts (23 August 2018). * The category “UN system” includes officials of the African Union-United Nations Hybrid Operation in Darfur (UNAMID). In 2018, Council members held 120 consultations on a variety of topics. Further to scheduled consultations, other topics were raised under the item “Other matters” in 35 instances. The most discussed topics in consultations during 2018 were: (i) Syria (33 times); (ii) Sudan/South Sudan (14 times); and (iii) the Democratic Republic of the Congo (11 times). Below is an infographic of topics discussed at least three times in consultations during 2018. Under-Secretary-General for Humanitarian Affairs and Emergency Relief Coordinator, briefs the Security Council on the situation in Syria via video conference (22 February 2018). The Council continued to use video tele-conferencing (VTC) for meetings and consultations, a practice that has become increasingly prevalent since its introduction in 2009, resulting in an average of more than 55 VTCs per year. In 2018, the Council was briefed via VTC 88 times, from different locations, including Bangui, Jerusalem, Kinshasa and Tripoli. In 2018, the practice of holding informal interactive dialogues (IID) continued. IIDs, also known as informal interactive discussions, are chaired by the President of the Council and are intended to allow Council members to informally exchange views with interested parties on specific topics. In 2018, the Council held six IIDs covering matters relating to country-specific situations, including Iraq, Syria, and Libya as well as thematic issues concerning peacebuilding. [For details see Annex, Table II]. Members of a Security Council delegation visiting Bangladesh meet a group of refugees to hear their stories at Kutupalong Refugee camp in Cox's Bazar (29 April 2018). Article 34 of the Charter of the United Nations provides that the Security Council may investigate any dispute or any situation which may lead to international friction or give rise to a dispute. Missions of Council members to the field have taken place since 1964. 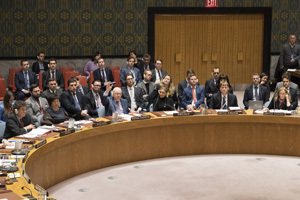 In 2018, three Security Council missions were dispatched. From 12 to 15 January the Council sent a mission to Afghanistan, led by Kazakhstan; from 28 April to 2 May the Council sent a mission to Bangladesh and Myanmar, co-led by Kuwait, Peru and the United Kingdom; and from 5 to 7 October the Council sent a mission to the Democratic Republic of the Congo co-led by France, Equatorial Guinea, and the Plurinational State of Bolivia. * In 2014, the Security Council dispatched two missions; one mission to Africa and one mission to both Africa and Europe. 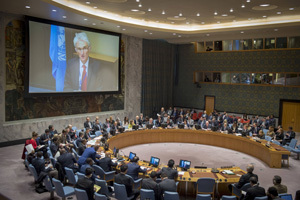 Security Council considers actions to improve UN Peacekeeping Operations (28 March 2018). In accordance with rule 11 of the Provisional Rules of Procedure and presidential note S/2017/507, every January, the Council reviews the list of matters of which it is seized. Agenda items which have not been considered at a Council meeting in the preceding three years are deleted unless a Member State objects. In the latter case, an item will remain on the list for an additional year, and will be subject to the same procedure described above if not considered by the Council during that additional year. In 2018, the Security Council considered a total of 48 agenda items. Out of the 48 agenda items, 27 addressed country-specific or regional situations and 21 thematic and other issues. [For details see Annex, Tables IV]. In addition, from the items identified as subject to deletion in 2018 only one, “The situation in Sierra Leone” was deleted from the list of items of which the Security Council was seized. Moreover, the items “International Tribunal for the Prosecution of Persons Responsible for Serious Violations of International Humanitarian Law Committed in the Territory of the Former Yugoslavia since 1991” and “International Criminal Tribunal for the Prosecution of Persons Responsible for Genocide and Other Serious Violations of International Humanitarian Law Committed in the Territory of Rwanda and Rwandan Citizens Responsible for Genocide and Other Such Violations Committed in the Territory of Neighbouring States between 1 January 1994 and 31 December 1994” were subsumed under the item entitled “International Residual Mechanism for Criminal Tribunals”. In this year, the Council also considered one new item entitled “Letter dated 13 March 2018 from the Chargé d’affaires a.i. of the Permanent Mission of the United Kingdom of Great Britain and Northern Ireland to the United Nations addressed to the President of the Security Council (S/2018/218)” bringing the total number of items on the agenda of the Council to 69. In 2018, on two occasions, the provisional agenda for the meeting failed to be adopted due to the lack of the required number of affirmative votes. This happened on 19 March 2018, at the 8209th meeting (S/PV.8209) which had been convened under the item entitled “The situation in the Middle East” in connection with the conflict in the Syrian Arab Republic, and on 26 November	2018, at the 8409th meeting (S/PV.8409) which had been convened under the item entitled “Maintenance of international peace and security” in connection with the tensions in the Sea of Azov. United Nations High Representative for Disarmament Affairs, briefs the Security Council as it considers the situation in the Middle East (5 February 2018). In 2018, 72% (206) of the meetings of the Council dealt with country-specific or regional situations. Among those meetings, Africa accounted for 50% (103) of the meetings, followed by the Middle East with 32.5% (67), Europe with 7.8% (16), Asia with 5.3% (11), and the Americas with 4.4% (nine) each. In 2018, 28% (80) of Council meetings were held under agenda items of a thematic or cross-cutting nature. In addition, the Council continued the practice of conducting wrap-up sessions and did so at the end of every month except for September and December. In January, under the Presidency of Kazakhstan the wrap-up session was held as a formal meeting of the Council under the item “Implementation of the Note by the President of the Security Council (S/2017/507)”. All other meetings took place as informal briefings. 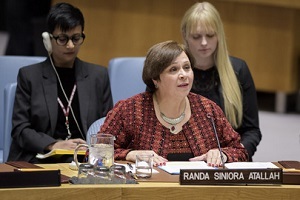 Randa Siniora Atallah, General Director of the Women's Center for Legal Aid and Counselling in Jerusalem, addresses the Security Council meeting on women and peace and security (25 October 2018). 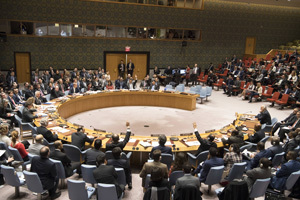 Security Council fails to adopt draft resolution on Syria (10 April 2018). According to Article 27 of the Charter of the United Nations, each Council member has one vote. An affirmative vote of nine members is required for decisions to be adopted on procedural and substantive matters, including in the latter case the concurrent votes of the permanent members. In addition to procedural decisions related to the adoption of the agenda, extension of invitations and adjournment of meetings, the Council adopts resolutions and issues presidential statements. Council decisions also take the form of notes and letters by the President of the Council. In 2018, the Security Council adopted a total of 54 resolutions and issued 21 presidential statements. The Council also issued 8 notes, 32 letters by the President and 87 press statements. In 2018, procedural matters relating to the adoption of the agenda and to extension of invitations were put to a vote on four occasions. The chart below shows the total number of procedural votes over the past five years. Security Council votes on resolution on Yemen (26 February 2018). Out of its 54 resolutions, 27 (50%) were explicitly adopted under Chapter VII of the Charter and 21 of the 27 resolutions (77.8%) concerned the African continent. In 2018, the Council unanimously adopted resolutions 2417 (2018) condemning the use of starvation of civilians as a method of warfare, and 2419 (2018) on the role of youth in the maintenance of international peace and security, building on resolution 2250 (2015), and issued presidential statement S/PRST/2018/10 welcoming the Secretary-General’s “Action for Peacekeeping” initiative. By resolution 2444 (2018) the Council decided to lift the arms embargo, travel ban, assets freeze and other targeted sanctions imposed on Eritrea by its resolutions 1907 (2009), 2023 (2011), 2060 (2012) and 2111 (2013). By the same resolution the Council decided to terminate the mandate of the Somalia and Eritrea Monitoring Group (SEMG) while establishing a new Panel of Experts on Somalia mandated to, inter alia, monitoring and investigating the implementation of the sanctions measures imposed on Somalia. In 2018, 45 of the 54 resolutions and 13 of the 21 presidential statements concerned country or region-specific situations or conflicts; Africa accounted for 69% of those resolutions and presidential statements (40 in total), followed by the Middle East with 15.5% (nine), Europe with 6.9% (four), Asia with 5.2% (three), and the Americas with 3.4% (two). In 2018, the Council issued 87 press statements, of which 54% (47) concerned terrorist-related activities, attacks against civilians or attacks against United Nations personnel in the field. In addition, the most referenced countries or regions in press statements were the following: Afghanistan (21 times), the Central African Republic and Mali (nine times each), and the Democratic Republic of the Congo (eight times). In 2018, out of 54 resolutions, 45 (83.3%) were adopted unanimously. In 2018, three vetoes were cast (see below). 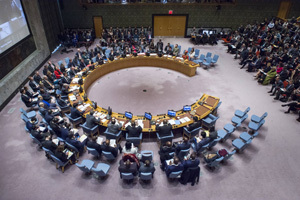 The vetoes were cast in relation to draft resolutions put to a vote in connection with the item entitled “The situation in the Middle East”, in the context of the conflicts in the Syrian Arab Republic, and Yemen, as well as in connection with the item entitled “The situation in the Middle East including the Palestinian question”. Furthermore, in 2018 four draft resolutions were not adopted due to an insufficient number of affirmative votes. A Council member or any other Member State, whether Council member or not, that directly submits a draft resolution is referred to as sponsor or co-sponsor. A draft resolution co-sponsored by all Council members is referred to as a “presidential text”. In 2018 one presidential text was tabled and unanimously adopted as resolution 2439 (2018) relating to the Ebola outbreak in the Democratic Republic of the Congo. The chart below shows the number of presidential texts, compared to the total number of resolutions adopted per year, for the period 2008-2018. Security Council extends authorization for inspection of vessels off the Libya coast (11 June 2018). In the period 2008 to 2018, the Council adopted a total of 657 resolutions, out of which 601 (91.5%) were adopted unanimously. In this period, 21 vetoes were cast. The year 2017 registered the highest number of vetoes since 2008 with a total of six vetoes. The chart below shows the voting record in the period 2008-2018, illustrating the number of draft resolutions adopted unanimously, and non-unanimously, as well as the number of draft resolutions vetoed or not adopted due to the failure to obtain the required number of votes. In 2018, the Council continued its practice of including provisions on cross-cutting issues, namely the protection of civilians (POC), women and peace and security (WPS) and children and armed conflict (CAAC), in its resolutions and presidential statements relating to country-specific or regional situations. In 2018, the Council adopted 58 decisions relating to country-specific or regional situations. Out of the 58 resolutions and presidential statements, 72.4% of them (42) contained one or more provisions on WPS, 70.7% of them (41) contained one or more provisions on POC, and 44.8% of them (26) contained one or more provisions on CAAC. In 2018, out of a total of 54 resolutions, the Council adopted 27 resolutions explicitly “acting under Chapter VII of the Charter”, including two resolutions (on non-proliferation/DPRK, resolution 2407 (2018), and on the Sudan and South Sudan, resolution 2418 (2018)), explicitly “acting under Article 41 of Chapter VII of the Charter”. [For details see Annex, Table VI]. Out of the 27 resolutions adopted under Chapter VII, 20 extended and modified mandates of peacekeeping operations and sanctions related bodies. Flooding in the town of Bor, South Sudan, at the start of the rainy season destroyed the homes of over 2000 Internally Displaced Persons (IDPs) in the Protection of Civilians site located on the base of the United Nations Mission in South Sudan (UNMISS). 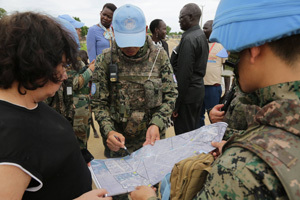 UNMISS engineers and local officials, visit the affected areas and devise a plan to mitigate the damage (14 May 2018). During 2018, the Council adopted decisions concerning the mandate of 11 peacekeeping operations (out of 15 that were in operation in 2018) and six special political missions and peacebuilding offices (out of ten that were in operation in 2018), primarily extending their mandates. On 30 March 2018, the United Nations Mission in Liberia (UNMIL) completed its mandate and by S/PRST/2018/8 the Council expressed its appreciation for the important contribution of UNMIL, and its civilian and uniformed personnel, to promote peace, stability and development in Liberia. 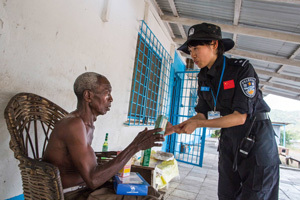 United Nations Mission in Liberia (UNMIL) peacekeeper gives medicines to the local guard of the former UN base in Tubmanburg, destination of the last long-range patrol the contingent was conducting before withdrawal (1 February 2018). 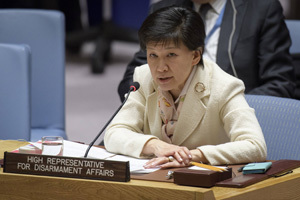 In 2018, the Council welcomed the initiatives of the Secretary-General to standardize a culture of performance and to develop a comprehensive and integrated performance policy framework in connection with the following UN peacekeeping missions: UNISFA, UNIFIL, UNAMID, UNFICYP, MINUSMA, MINURSO, UNMISS, MONUSCO, MINUJUSTH, and UNDOF. In addition, the Council requested to take into account gender considerations in the implementation of the mandates of MONUSCO, UNIFIL, UNAMID, UNOCA, UNAMA, UNAMI, UNOWAS, and UNSMIL. Moreover, recognising the adverse effects of climate change, ecological changes and natural disasters, the Council requested to take this information into consideration in the activities of UNOCA and UNOWAS. For details see the comprehensive Mandate Table of current peacekeeping and political missions. In addition, in 2018, four peacekeeping operations underwent revisions of their respective authorized ceiling of troop and/or police strength, namely UNMISS, MINUJUSTH, UNAMID and UNISFA. 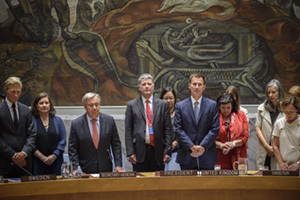 Security Council Committees and Working Groups met a cumulative number of 144 times in 2018, in both formal and informal formats, as well as in joint meetings. A total of 14 briefings to Member States were also conducted by sanctions and other committees. As of 31 December 2018, a total of 708 individuals and 387 entities were subject to United Nations targeted sanctions and restrictive measures such as assets freeze, travel ban and arms embargo. A consolidated list containing the names of the individuals and entities subject to United Nations targeted measures is also available on the Security Council website. In 2018, 30 individuals and 24 entities were added to the list. The charts below illustrate the number of listed individuals and entities for each sanctions committee as well as those added this year. Information on each committee, including individuals and entities designated by the relevant committee and the applicable sanctions measures, as well as the procedures for the processing of listing and delisting requests can be found on the Security Council website. In 2018, 22 entities were removed (also referred to as “de-listed”) from the respective sanctions lists while no individuals were de-listed. De-listing requests in relation to the ISIL (Da’esh) & Al-Qaida Sanctions List are submitted directly to the ISIL (Da’esh) and Al-Qaida Sanctions Committee or the Office of the Ombudsperson. De-listing requests with respect to all other sanctions lists are submitted to the respective sanctions committees or through the Focal Point for De-listing in the Secretariat. Any Member State can propose the de-listing of an individual or an entity. The relevant committee then considers the proposal, often in consultation with the designating State, and makes a final decision on whether or not to de-list. Often those proposing de-listings are the State of citizenship or residence of a listed individual, the State of location or place of registration of a listed entity, the designating State itself, or a Council member. In addition to the Member States’ ability to de-list, two mechanisms have been established to strengthen the de-listing process: the Office of the Focal Point for De-listing and the Office of the Ombudsperson. Established in 2006, the Office of the Focal Point for De-listing has received a total of 96 requests to de-list individuals and/or entities. 87 of these requests have been processed by 31 December 2018 and eight are pending. As a result of this process, a total of 17 individuals and 17 entities have been de-listed and 42 individuals and 20 entities remain on the list. The Office of the Ombudsperson, established to serve as the de-listing mechanism for the ISIL (Da’esh) and Al-Qaida Sanctions Committee, has received a total of 82 requests to de-list individuals and/or entities since 2009, of which 74 have been processed and four are pending. As a result, a total of 52 individuals and 29 entities have been de-listed and 17 listings remain. The chart below shows the number of Council resolutions extending the mandate of subsidiary bodies of the Council by month over the last five years [For details, see Annex, Table VII].